Reader question: How to store earrings? Do you or any of your readers have a suggestion for storing earrings so that they are (preferably) not visible at all (i.e., in a dresser drawer or someplace else) or at least displayed elegantly in a way that takes up minimal space and doesn’t add to a visual sense of clutter? Thanks! This is a great question, Laure! 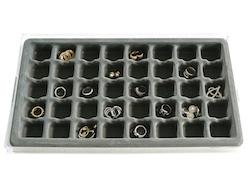 A 40-compartment tray would be great for earrings and the matching trays for your other jewelry would work well too. I use a tool chest as my jewelry box and the trays would sit in the drawers nicely. I think that egg cartons or ice cube trays could serve the same function. You could line the egg carton or ice cube tray with fabric if you wanted to protect your jewelry and make the trays look more sophisticated. I think it is best to put your jewelry in a drawer for protection. It’s a lot more difficult to lose a valuable earring if it’s not out where someone could accidentally bump it. Thank you, Laure, for your question. I hope our answer was helpful! When my mom is traveling, she uses a seven-day pill box to keep her jewelry together. I keep my earrings in a drawer in ice cube trays. I use the small clear fishing tackle boxes – they’re cheap and have two sides – and lots of little spaces for necklaces, earrings and bracelets. I’ve always used a bead organizer for all jewelry (necklaces, earrings, and rings). Pieces of plastic canvas are also really great for earrings. They also provide the earring something to hold onto so that the earring back and earring stay together. @Kathy — I LOVE the ice cube tray idea!! I used a “chiclet-type” gum wrapper to organize small pairs of earrings. There are also tonnes of bead organizers at Dollarama that do a great job of organizing earrings. I use an antique jewelry box from my grandmother. It sits inside our armoire, but it’s pretty when I open the doors. In the drawer where I keep the earrings, each pair is on a button, so I can easily find both earrings at once. The button idea is genius, Corinne! @Corinne — Can you explain the button idea a little more? Do you put the posts through the button holes? It sounds like a great idea, if I’m imagining it correctly! My earrings are in my top dresser drawer in two side by side desk drawers organizers, like the ones you pick up at Walmart, etc for a dollar or so. The smaller sections hold my earrings, the larger ones hold my barrettes, boxes of bobby pins, etc. I attach my stud earrings to a long ribbon. My French hook earrings are in film cannisters. I, too, use a plastic bead organizer for my earrings. It has 25 small plastic areas inside and I separate the earrings by color and type. Snap the lid on, slide it in a drawer and you’re done. For necklaces and bracelets, I put tiny adhesive hooks on the back of my medicine cabinet door and they hang there. I close the door, they disappear. I, too, forget things if I can’t see them so this way, I open the door, and it’s all there. It also helps that I don’t have a ton of jewelry. i use a rectangular piece of plush (black) and attach the earrings there. For my rings i made a kind of sausages made out of cotton and plush, and there i put them (as if the sausages were long fingers). Both are placed inside a rectangular box, to keep it all in one place and dustfree. I use these stacking pill containers that I get at the Container Store. They screw into each other so when I travel, I just take the ones I want. I keep them in my dresser drawer. i have a pax wardrobe from ikea, in which i have a large 2.5 x 3 (approx.) drawer that holds all my jewelry, organized by type and color. the front of the wardrobe has sliding doors…all “clutter” is then hidden away behind it, and jewelry stays organized. it’s an especially good jewelry or accessory solution for those who need more space for storage anyway. i have another drawer exactly like that in which i store my belts (i have a sizable vintage collection of both belts and jewelry). would also work well for scarves. I picked up a screw/nail sorter from the tools department at a nearby Target. And the way the one I have is set up, there are small parts for earrings, and larger areas for coordinating necklaces. I use the little 2×3″ or 1×2″ zip lock plastic bags from the craft store to put my jewelry in and keep them in my jewelry box sections and drawers. It allows me to keep small pairs of earrings together, prevents necklaces from getting tangled, and keep together matching earring, bracelet, and necklace sets. It also makes it easy to grab stuff and toss in my toiletries bag for travel. These things get stacked in a old shoe box. Also, I use an old shoe box to hold all my headbands and hair clips. Inside of that is also a thin piece of cardboard which holds bobby pins. Fwiw, check boxes are my primary mode of organizing. 🙂 With the advent of blank cds, all my old floppy disk boxes are getting new uses too. And hang all my earrings nicely displayed! At the same time i stuck hook all around the earrings display and hang my necklaces! For me, If I do visually see it, I will never wear it or even remembered I even owned it in the first place! I too use a bamboo place matto hang my dangly earrings, because I like to have those items on display. But it doesn’t work for necklaces or studs, really, so I’m going to check out the Target tool section. Amy Sedaris recommends using chicken wire or mesh from a screen door, as well as an egg carton. My mom uses old chocolate boxes, kind of along the lines of the ice cube tray. Just prettier. But less sturdy in the long term, I suppose. How store earrings? I not know. I’m surprised no one suggested “have fewer earrings”. This isn’t exactly “uncluttered” but I, too, need to see my earrings to remember them. I almost exclusively wear french wires. I took a small wooden photo frame, removed the glass, and stretched a piece of window screen over the backing (with a pleasant sheet of paper behind the screen). The frame stands on my dresser relying on the built in stand. It could hang in a closet or dressing room if I had such luxuries. It’s easy to hang the french wires on the mesh. My 4 x 6 frame neatly holds 9-12 pairs of not too large earrings. The studs and rubber stops for the wires live in a small wooden box that lives on my dresser. The box could easily move to the drawer except that it still makes me smile to see it. I use a great device that I found over at Etsy…basically a picture frame with earring mounts put in. Ever since I switched I use more of my earrings more often, and I know better what I’ve got! A friend of mine (female) does the same thing as Nadia, except that she keeps her hanging cloth on display on the otherwise empty side wall next to her vanity in the washroom. As well as earrings and broaches, she adds buttons and pins she collects, and it is a great conversation piece. She has a couple open-hoop earrings that she never wears anymore but on which hang her necklaces. She is not too worried about security, because there are never more than 2 or 3 guests in her small apartment at any one time. Wow. This is late, but I love what my wife does with her earrings. She got herself a standing photo frame with a black cardboard backing. Punching holes in it, she then hangs her earrings in a tasteful display. I thought it was such a neat idea. I wanted something cheap and temporary. I strung dental floss tautly between two pushpins on a wall inside my closet. This is good for hanging earrings, but doesn’t work for studs or posts. I love the chocolate box idea! I use the pill boxes marked for days of the week. You can close the top on each day as added protection. I have seen boxes with 4 sections per day, so that would yield 28 sections with a pair or two in each one, depending on the size of the box and the size of the earring. I have used sheets of styrofoam to keep my pierced earrings under control. I cut thin sheets to fit inside pretty boxes or to fit inside a drawer. I just press the earring posts or hooks into the foam. You can see them all at a glance. I use the 7-day pill boxes for my earrings–a round one for my small jewelry box, and a long one for the less-used earrings I store in another spot. They’re great, and can hold multiple pairs of small-to-medium post earrings. Look for the ‘extra large’ ones for larger earrings. It also keeps my cat from turning them into sparkly/shiny toys! Love these ideas, including the ones from 2007. It would be great, though, if the outdated links (all of them!) from 2007 were removed before re-posting this piece! I, too, use a 7-day pill box to hold my jewelry while traveling — such a great idea! I usually wear the same pair of earrings every day, and I occasionally switch out to two different pairs. Since I have so few, I put each pair in a separate medicine cup, the kind that come with a cough medicine bottle. The cups stack, taking up a small space on my counter, and it is easy to pick up the cup and pour the earrings into my hand. It’s faster for me than getting the earrings out of a small section. Also in my stack of cups, I have a couple cups with safety pins for wardrobe adjustments. As a jewelry maker and self-proclaimed earring whore, I love to display my hoard. No, I don’t consider it clutter if I wear it. :p I have several gorgeous frames hanging in my studio that I stapled hardware cloth in and hang the earrings from that. Most are French hooks or lever backs. Necklaces hang from tiny S hooks I made from craft wire. The “good” jewelry (Granny’s diamonds, etc.) doesn’t go on display. It’s locked up if I’m not wearing it. Most of the jewelry I make is sterling and bound to tarnish the way I store it, so I keep a polishing cloth handy (Sunshine cloth is what I use). Rooting through a bunch of ziplock bags inside a box is way too fiddly for me. For those of you who store in bags, 3M makes anti-tarnish paper that prevents tarnish on sterling. I keep rolls of sterling wire in sealed bags with a couple of tiny pieces and it is pristine.